Gianni Grippo is amongst the best brown belts on the planet. He is a 5 time World Champion and 7 time Pan champion (Yes you’ve read right). Gianni started Jiu-Jitsu at 10 years old as the sole member of Renzo Gracie kid’s program, and started competing everywhere around the country and also the world. We look forward to seeing Gianni competing as a Black Belt and making an immediate impact in the big boys club. 1. 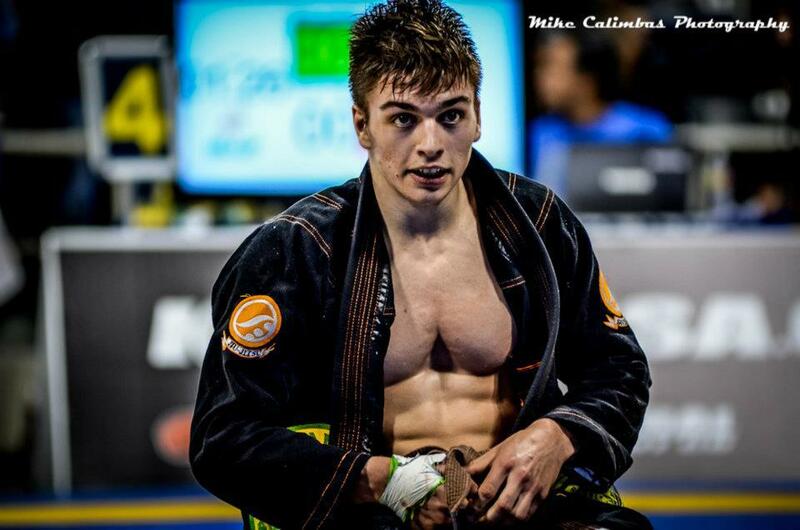 Hi Gianni can you please introduce yourself to the BJJ Community of Eastern Europe? Hi everyone! My name is Gianni Grippo and I am a 20 year old brown belt under Renzo Gracie. I live in New Jersey with my parents- Angela and Frank Grippo and my younger brother Christjon. Although I live in NJ, I commute into NY to train everyday at the World-famous Renzo Gracie Academy in Manhattan and I have been training there consistently since I was 10 years old. During my 10 year career, I have been able to win a lot of matches in numerous states and countries but what are my most important titles are my 5 IBJJF World Championships and 7 IBJJF Pan Championships. Another thing that I am proud of is that I have medaled at every World championship (10x Worlds medalist) and every Pan championship (9x Pan Medalist) that I have ever entered. And although these success’s have been nice, they are not enough, currently I am working very hard to achieve my 8th Pan title and 6th World championship in the coming year. I promise 2013 is going to be fun! My Jiu-Jitsu story actually started at a boxing gym that I went to in Paterson, NJ when I was only 9 years-old. For 2 years, I was always very much enthused by boxing and had actually fought in numerous amateur boxing matches in the 60-pound weight class (I was not very good!) But, although I had a great enthusiasm for boxing, my father and I were always looking for me to try something new. Then one day at my boxing gym, someone told me and my dad about the Renzo Gracie Academy in New York City and we checked it out right away. Little did my dad and I realize how rough the area was where the gym was at. The academy was on the fifth floor and every other floor was a drug-clinic for drug abusers and serious drug dealers, so it’s safe to say I met a lot of interesting characters during those scary early years. Then I can say that I truly fell in love with the sport when me and my mother went down to Brazil for the first time in 2004. When I was down there, I was fortunate enough to witness the epic absolute final between Roger Gracie and Ronaldo Jacare. The passion that the people had for the sport, and the excitement that unfolded in front of my eyes on that mat left me in absolute awe. I knew I wanted to be out there someday, on that big stage in the World’s biggest championship. After that trip to Brazil, I knew that Jiu-Jitsu was what I wanted to do for the rest of my life. Yes, I am studying in journalism but I admit, I do not know what I want to do with that in the future. I do write Jiu-Jitsu editorials for an MMA website but that is about it, right now. What I really want to do in the future is open up my own gym. I believe any serious competitor and lover of the sport dreams of having their own school and I am no different. I hope to never hold a “real job” because in my opinion, teaching Jiu-Jitsu is too much fun to be called a real job- that’s my dream job. 4. You are a frequent competitor. What is it about competition that you like so much? I think I’ve always had a great enthusiasm for competition, even at an early age. I even remember when I would play with my dad in checkers or chess, he would beat me every time and I’d always cry and/or throw the board across the room. Against my dad I always wanted to prove myself and show that I was good, and to this day that’s what I try to do with Jiu-Jitsu. Also I enjoy the energy of competing. Unfortunately many people go through daily life without any adrenaline rush, or any excitement. Jiu-Jitsu gives me my excitement, especially when I compete, and that’s what gets me up in the morning to go train harder. 5. Please tell us about your Italian background. Are you a active member of the Italian/ American community in NY? Well my great-grandparents (on my fathers side) came from Naples, Italy into the United States. I admit though I have been very American-ized and although I know a lot about my family’s Italian roots I do not speak any Italian, which is my biggest disappointment in myself. But I can say, that after every tournament I’m in, the only place I like to go to for a post-tournament celebration is my grandmother’s house where she makes the best pasta with meatballs. The best especially after a difficult weight cut process! 6. Please tell us about the training at RGA? How does it differ from other BJJ academies? Who are your favorite instructors there and why? Probably my most influential instructor has been John Danaher. I have taken a lot from him over the years, not only in the techniques, but how he mentally approaches the sport. What makes him great, is his ability to keep an open mind to every style there is in the sport, and with each style he is able to take the best of everything and put it into his own game. He is a true innovator and genius in our sport and the name John Danaher must never go unknown in the Jiu-Jitsu community…he is that good. 7. What are BJJ players that you admire, and why? There are a lot of BJJ players I admire, but two that I admire the most are the Mendes Brothers. I have been watching them for quite sometime now and they never cease to amaze me. Like Danaher, they are also innovators and creators always looking to seek improvement in their technique and style. What I see from them is that there never can be satisfaction with what you already have, you must always want more and always seek to become better, little-by-little. 8. What did you think about the Metamoris Pro event? Do you like these rules? I really liked the Metamoris event! These types of events will help make Jiu-Jitsu a more popular sport and may help catapult this sport into the Olympics someday. No advantages, no controversial judges decisions, just pure Jiu-Jitsu looking for the submission. This is exactly what our sport needs. 9. What is next for you in 2012/2013? For the rest of 2012, I will be dedicating all of my time to training for 2013 while running some seminars on the side as well. To start 2013, I will be competing at the European Championships and from there I am looking to be competing at all the major championships in 2013 including the Worlds in June, that is always the date I circle on my calender. 10. Thanks Gianni and all the best! And thank you for wanting to interview me, I really appreciate it! OSSS!